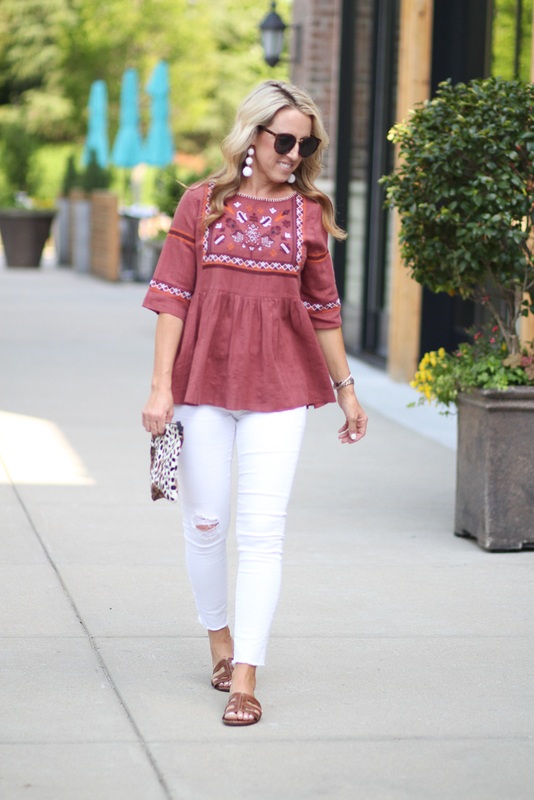 How perfect is this embroidered top? I mean a babydoll fit mixed with gorgeous embroidery! 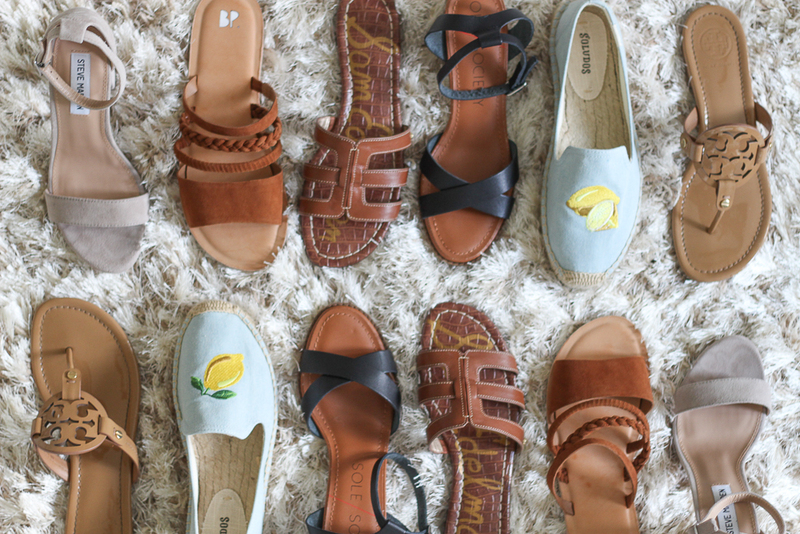 And I'm rounding up my 5 favorite Summer shoes to wear with it! I hit "add to cart" the moment I saw it!! It also comes in a pretty white with blue embroidery, but the embroidery is different, more of a stripe pattern. I usually go for blue and white because it's such a fresh and light combo for Summer, but I just loved this light red with the bold embroidery! I paired the top with my favorite white jeans to keep the look light, but it will be so cute this Summer with jean shorts. I love how Nordstrom offers a mix of price points, both save and splurge items. My favorite white jeans are only $64. With every changing season, I always end up buying at least 1 (usually more) new shoe. A style or trend that's new to that season. For Fall/Winter, it's the bootie. For Spring/Summer, it's the sandal. I love wearing sandals! All types from flip flops, to slides, to heels. They just look so pretty against freshly manicured toes!! Nordstrom is the best place to find shoes. From their gorgeous in-store shoe department to their amazing on-line store, with free shipping and free returns, they offer the biggest selection! I can always find the trend I'm looking for. For this look, I added my newest sandal, the slide. Slide sandals are super popular right now. What's not to love?! They are quick to put on, no buckling or tying. This pair comes in 5 colors. If you're looking for new and trendy pieces for the Summer, be sure to check Nordstrom first. For this Summer, these are the shoes I'll be wearing. These styles are what's trending...and for good reason! 1. The slide - Like I said above, easy to slide on and go. And they go with everything from jeans to dresses to shorts. 2. Strappy slides - A little more casual, more for your day-to-day looks. 3. Ankle Strap Sandal - This style is so flattering. It looks amazing with dresses and instantly dresses up your jeans. I love the lower block heel for the day and the taller block heel for evening and dressier looks. The block heel makes it trendy and more comfortable to walk in. 4. Flip-flop - I wear these almost daily. Again, so easy to slide on and go. These are a little pricy for flip-flops, but so worth it. The quality is amazing and will last year after year. 5. Espadrilles - So many options! From loafer to wedges, I love them all. They are a classic Summer piece while still being trendy! How adorable is that blouse! 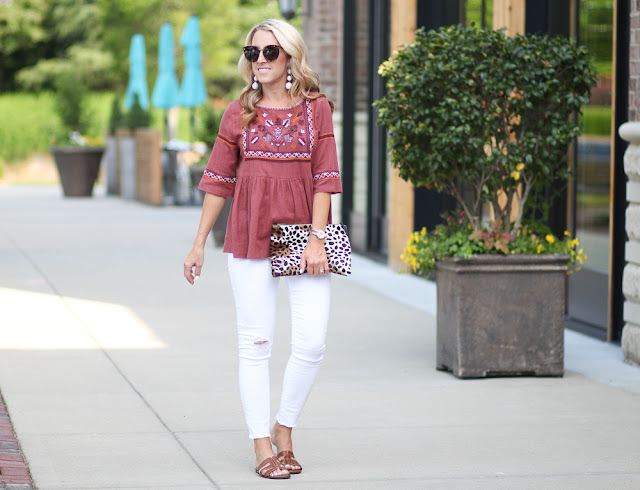 Love the top and how you paired it with the leopard print clutch! Yes, I use this leopard clutch all the time! It goes with so much. This top is so pretty! and I love those slides!! I love love love this embroidered top! And the shoe selection with it is perfection :) Great outfit! Meg, thanks thats so sweet! That top and those shoes! TOO CUTE! 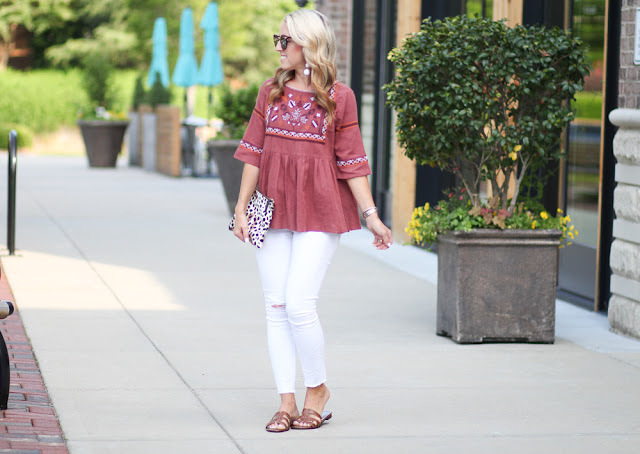 love this embroidered top! so cute! Such a great top!! Love how you styled it! I am in love with all things embroidery at the moment. I love the smocked fit on this top too! 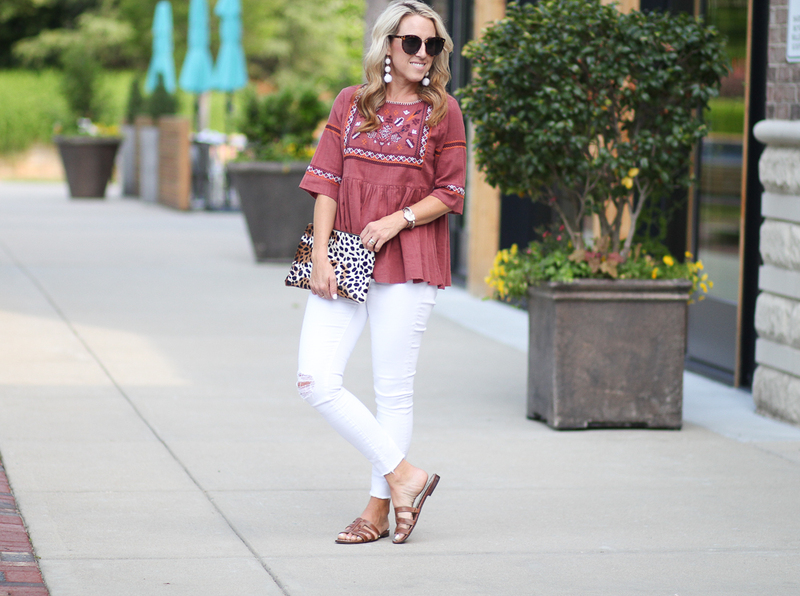 I love your embroidered top and those white jeans are perfect on you! And I love the pop of leopard!